Want to win the chance to go watch Somerset County Cricket Club play Derbyshire County Cricket Club in Royal London One-Day Cup on the 26th July 2015? 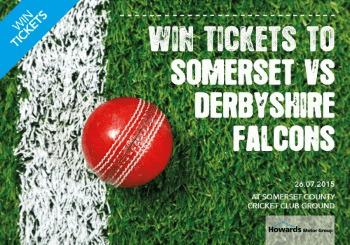 At Howards, we are giving away 3 x Family tickets, and 4 x Couple Tickets to watch Somerset vs Derbyshire Falcons in the Royal London One-Day cup on the 26th July 2015- all you have to do is enter our Facebook competition. To enter, head over to our Howards Facebook page, find our cricket post where you need to Like & Share and Comment which set of tickets you would like for a chance to win the perfect day out with your family or a friend. You have until the 24th July at 10am to enter to win these brilliant tickets! Don’t forget all you have to do is Like & Share our cricket post and tell us which tickets you would like to win! Be quick get your entries in!